This is a review of Soulflower Happy Feet Soap (see my Soulflower haul post HERE). 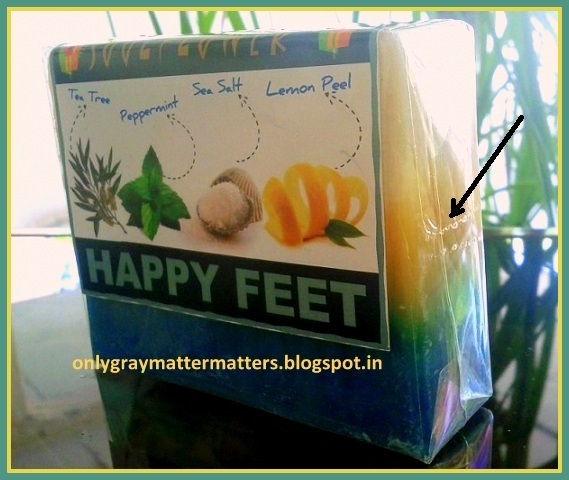 I am using the Happy Feet soap for the past 10 days now and it has indeed made my feet happy. In the past I had been using scrub soaps for my feet (See HERE). While they cleansed my feet very well, my heels were constantly dry and cracked. I tried changing my daily footwear thrice in a short period, it didn't help. All foot creams provided temporary relief because all moisture was again lost with the next bath. Only recently did I realize that your feet need good moisturization in summers too. And you need some gentle cleanser to keep them happy, without ripping further moisture from them. I had seen the Happy Feet soap a year ago, but passed it as too costly. But now after using it, I feel it is every penny worth it. And I bought this soap at 15% off, during one of their many offers. Besides, I also earned Soulpoints on my purchase, which I can go on accumulating and use later to buy something. Contains essential oils of Tea tree, lemon, peppermint, crushed lemon leaves, fresh lemon juice and peel, Seasalt, Vitamin E, Glycerine, Aqua, Permitted edible color and aroma, saponified oil of olive, coconut, castor, palm and palm kernel. Does not contain artificial hardeners and preservatives. The soap bar was large so I cut it into 4 pieces as directed on the packet. It was soft and easy to cut with a simple knife. I had stored it in a close metal container in an almirah and the soap sweat a little when I unpacked it. But the moisture droplets vanished away in a few minutes on air exposure. The reason I cut this soap bar into rectangular pieces, and not squares is because it has 3 layers as you can see. 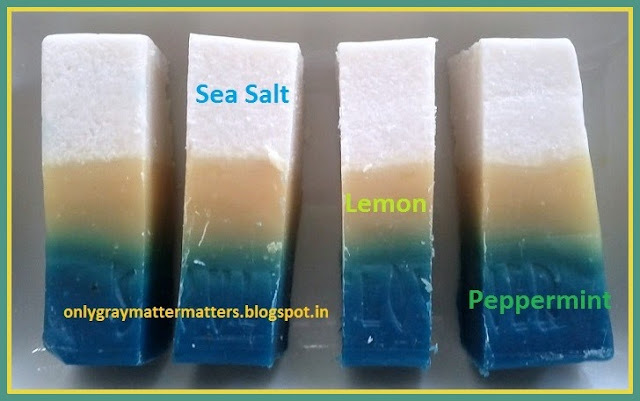 Cutting into squares would have given me two layered pieces with either Lemon and Seasalt, or with Lemon and Peppermint. This way I can enjoy the goodness of all the 3 layers. My little one loves running around with everyone's slippers except his own and that exposes me to some bare foot walk around the house. My feet had a layer of dead dry skin which would not liven up even with moisturizers. The skin on the sides of thumb and at the heels was hard. The first run of Happy Feet on my wet feet, the hard skin softened within seconds like some magic. I need ONLY two swipes or so and there was enough soap on my hands to massage up a creamy lather. I used a foot file but just to remove the dead skin. I did NOT have to scrub at all. Was actually amazed that some soap could clean my feet within seconds without even having to scrub, just gentle massaging! It saves time too because the creamy lather rinses off with very little water. I don't have to apply Happy Feet at the beginning of my bath session and let it work. I just use it in the end as it works within seconds. Even after 10 uses, the 1/4th soap piece looks almost as big as new. So one soap bar will last me a very long time, total value for money! 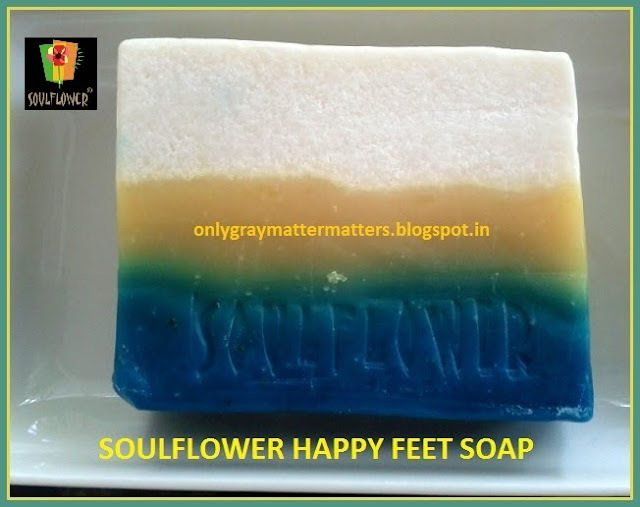 Soulflower Happy Feet soap is great for the present rainy season when there are higher chances of foot infection. Peppermint and tea tree oil prevent the skin from infections, improve blood circulation thereby helping tired feet. This soap also helps in removing odour. So it makes a great gift just for anyone: Yourself, for pampering and relaxation; your tired mother who spends long hours working and standing the whole day; your father, brother or partner whose feet remain closed in shoes the entire day or anyone who is prone to foot infections. Too strong for kids. It fizzes up on contact with water and I think it's because of the white Seasalt part. You can actually hear the fizz if you concentrate. The blue part is smooth and zesty. You feel a cool mild burning sensation on your feet due to the peppermint oil in the blue part, which is very relaxing. It smelt almost bitter initially due to the peppermint aroma locked inside the packing. The yellow part has no fragrance. May be the lemon and tea tree flavors are drowned by the strong peppermint, or they all together formed up a strong almost bitter fragrance. But you can't smell the soap otherwise, unless you bring it near your nose. Unwrapping Soulflower soaps is a little tricky as the packing is very neat and the seal is almost invisible. Look for the toothy cellotape edges. Cut the bar into 2-4 pieces and store away the remaining pieces in a cool dry place. I stored it in the same packing in a close tin box. If you store other Soulflower products along, the fragrances will mix! Wet your feet, not the soap. Else the white part will melt away quickly. After each use, let the soap dry for a few minutes and keep in a closed container or foil it. There are no artificial hardeners so it may dry up and crack if not preserved properly. For very smooth and beautiful feet, follow up with a good moisturizer or foot cream. 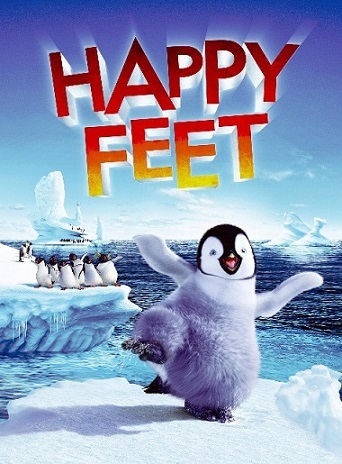 Wish you all too Happy Feet! very nice detailed review..soap looks yummy n colourful.. Thank Tejinder. 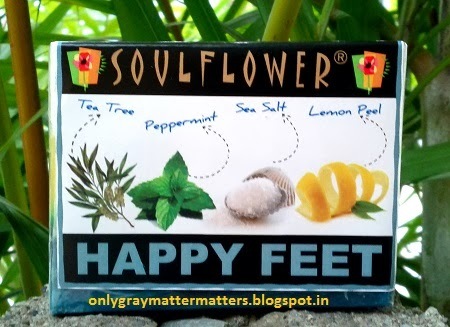 This Soulflower products are really very good. Wish had known about this brand when you were in India, could have tried a few. May be next time :) Thanks for your wishes, my hand is better now. Reading ur reviews n getting to know how u use Soulflower products, i've got few very useful tips...one of those is to cut the soap bars into pieces [as most of the times they don't even fit into my soap-case ;) and storing them separately to avoid mixed fragrances...i'll be implementing this as soon as i'll finish the currently being used Jasmine Soap. Though my feet have no cracks, but i have a regular problem of feeling dryness in my feet due to which sometimes i need to get up at night n oil them to soothe myself. I'm not sure if this soap can help me but I think i may give it a try.. Thanks Shilpa, I am happy that to know the review proved helpful to you. The dryness in the heels and the uneasy feeling is surely due to lack of moisture. This soap is not moisturising as such but yes, it does not leave your feet super dry like regular soaps, so it does prevent loss of natural moisture through gentle cleaning. It would still be a good one to use for many other benefits as it improves circulation too and just following up with a moisturizer would be enough. Also take at least 1 tablespoon of ghee in your daily diet to prevent over dryness. You can split that 1 spoon over three meals. Thanks so much for sharing your feedback Ankita and surprised to know you have already started using Soulflower products. Remember you had shown interest when I had posted my haul. 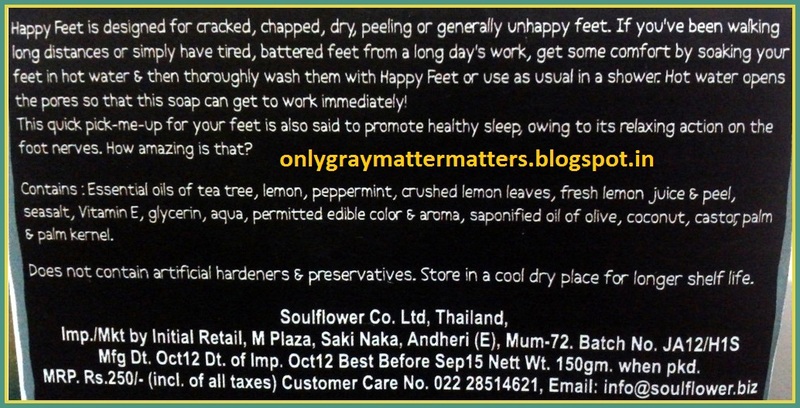 Agree with every bit you have mentioned :) It does make feet beautiful and soft. Happy feet! Wow this looks so beautiful tht I might not use it or use it miserly. Lovely review Gagan! He he that's cute Megha. My son also keeps raving about the colors in this bar. My feet are the most neglected part of my body. I think it will really help them. I agree with you it may look expensive but as we can cut it and use which also makes it easier to use and last longer, it is value for money then! 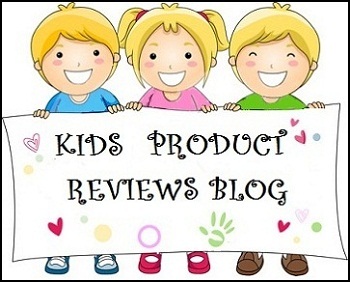 Nice review Gagan! :) I really liked the colors in this soap. Thanks Niesha. You are right, our feet bear all the burden of our body and the heat from the ground in summers and yet are mostly neglected. The soap bar does look very pretty and I had bought at 15% discount :) You will love it as it is an effortless product that works really well. 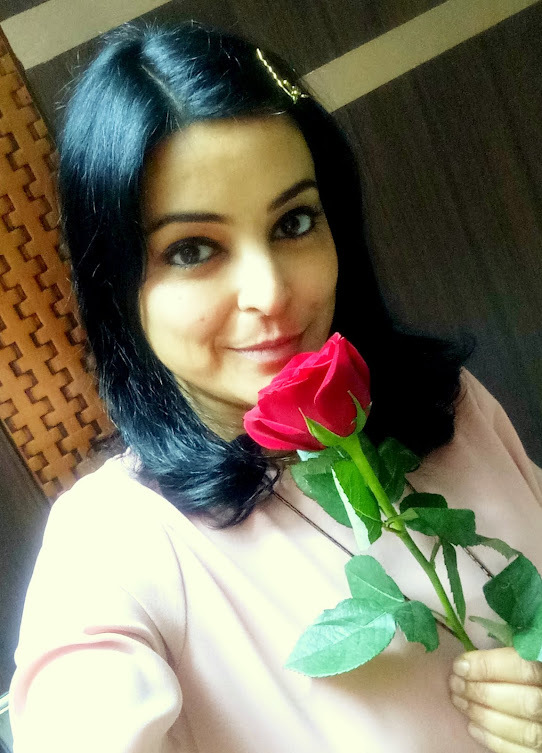 Awww thanks a ton for this immense support :) You made my day when I read this. Thank you.